Both Air Canada and WestJet in mid-2018 say they have no problem filling their cockpits with qualified personnel. “We get thousands of applications far exceeding vacancies in every round of pilot hiring and we have a rigorous selection process,” explains Isabelle Arthur. Director, Media Relations at Air Canada. A solution to the problem includes attracting more women to the aviation industry. Both Air Canada and WestJet in mid-2018 say they have no problem filling their cockpits with qualified personnel. 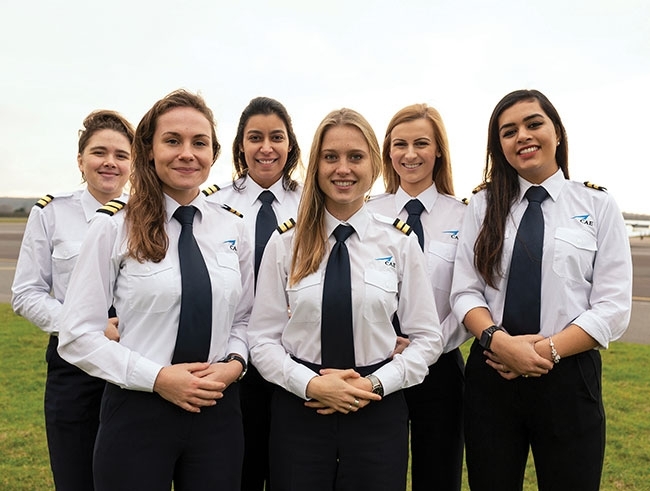 “We select only the best pilots to fly our planes and even before being considered by the airline, pilots require a minimum 2,000 to 3,000 hours of flying time.” In addition, the airline actively encourages women to consider a career in aviation. In mid-2018, of its 3,500 active pilots at the main carrier and Air Canada Rouge, 210 were women, representing six per cent of the total. Regional carriers like Porter tend have higher percentages. “Our talent acquisition team goes around the country visiting schools and taking part in activities during the International Women’s week and supporting the Northern Lights Award, whose mission is to encourage women to undertake careers in aviation by recognizing women in the field of aerospace and aviation,” says Arthur. The story is different for the smaller airlines, especially northern carriers who are losing pilots to bigger airlines in the south. The Air Transport Association of Canada (ATAC) estimates the industry will face a shortage of 6,000 pilots over the next 20 years, due to low wages for new pilots and the high cost of training. The industry is also expanding. According to Transport Canada, between 2010 and 2016, airlines added more than 2,200 new aircraft. Nearly 4,000 new pilots got their licenses during that time, but according to Victoria, B.C., flight school manager Gerry Mants, that’s not enough to meet demand. And at least one flying club almost closed its doors due to a lack of instructors, pointing to the growth of the industry, retirements from the Baby Boomer Generation, and fewer pilots entering the industry. “The major airlines are going after pilots from the regionals and the regionals are going after pilots from business aviation and private pilot instructors from places like ours,” says a spokesperson from the Ottawa Flying Club, which has managed to turn things around. It’s been a serious problem for at least the last four years and even the larger carriers have finally acknowledged it, McKenna adds. Several regionals have even cancelled flights, including Canadian North, Air North and Bearskin Airlines. Some smaller carriers have lost half their pilots, according to McKenna. The problem is compounded by foreign airlines recruiting Canadian pilots. “Some smaller carriers like Air Canada Jazz wouldn’t even talk to you if you had less than 1,000 hours. Now, if you have 200 hours, they at least want to get you into their system.” McKenna suggests solutions to the problem include attracting more women to the industry, more funding for expensive training, and to let former instructors hired away by airlines to continue to train during their down time. A report released in April 2018 by the Canadian Council for Aviation and Aerospace (CCAA) estimates Canada should be producing an extra 300 pilots a year to meet demand of a growing air travel industry. The report also warns how demand for new hires for expansion and replacement of retirees could mean a shortfall of 6,000 pilots by 2036. Projections show the industry will need an additional 7,300 pilots by 2025. Less than 1,200 new commercial pilot licences were issued in 2016 and almost half of those were issued to international students. The 1,200 figure is down 28 per cent from the 2009 peak of 1,645 licences. To compound the issue, only about 70 per cent of these new pilots choose to remain in the industry, which translates to fewer than 500 new pilots being available to Canadian aviation each year. If this continues, there will be a shortage of close to 3,000 pilots by 2025. Brace yourself for the pilot shortage: is it coming or not?